The central nervous system (CNS) is that portion of the vertebrate nervous system that is composed of the brain and spinal cord. Together with the peripheral nervous system (PNS), the other major portion of the nervous system, the CNS coordinates the body's interaction with the environment. The CNS is contained within the dorsal cavity, with the brain in the cranial subcavity (the skull), and the spinal cord in the spinal cavity (within the vertebral column). The human nervous system is the most complex object known to science, as it includes the intricate CNS and a brain with 10 billion neurons and many times more interneural connections (Anissimov 2007). For some people, this brain and the increase in intelligence it signifies is what separates human beings from other animals. As the difference is mainly a quantitative one, the gulf between humans and the great apes is seen as small, to the point that there is some advocacy to have chimpanzees placed in the same genus as human beings and great apes to be considered "persons" that should be accorded "human rights." However, for adherents of many religions, human beings are separated qualitatively from the rest of the animal world by having a spiritual nature and the presence of a soul or spirit, which exists in harmony with the body and CNS, but also transcends the physical aspect. For such, it is this spiritual aspect that defines the nature of humans more than the complex central nervous system. The nervous system is that network of specialized cells, tissues, and organs that coordinates the body's interaction with the environment, such as sensing the environment, monitoring organs, and coordinating the activity of muscles. The nervous system of vertebrate animals is divided into the central nervous system and the peripheral nervous system (PNS). The CNS comprises the brain and spinal cord, whereas the PNS consists of the nerves and neurons that reside or extend outside the central nervous system, such as to serve the limbs and organs. All parts of the nervous system are made of nervous tissue, which conducts electrical impulses. Prominent components in a nervous system include neurons (nerve cells) and nerves. Neurons are typically composed of a soma, or cell body, a dendritic tree, and an axon. The large majority of what are commonly called nerves (which are actually bundles of axonal processes of nerve cells) are considered to be PNS. The nerves that pass through the spinal cord, and nerves from the PNS, provide sensory input to the brain, which processes the information and initiates responses. The spinal cord serves as the main route for the movement of sensory information to and from the brain (Chamberlin and Narins 2005). Information flows to the CNS from the PNS, which senses the internal and external environment, and the response of the brain flows to the various organs and tissues by means of the spinal cord nerve network (Chamberlin and Narins 2005). The brain and spinal cord are covered by three layers of meninges, which are membranes of connective tissue. The meninges protect and nourish the neural tissue. Between the layers of meninges is an extracellular fluid called the cerebrospinal fluid. The brain is divided into the three major regions of the forebrain (prosencephalon), the midbrain (mesencephalon), and the hindbrain (rhombencephalon). The brain also has internal cavities (ventricles), which are filled with cerebrospinal fluid and connect with the spinal cavity. The spinal cord is a long column of neural tissue, extending from the brain downward through a canal in the vertebra, which protect it. The spinal cord and the brain have nerve cells called neurons, as well as glial cells. Glial cells, also called neuroglia or simply glia, are non-neuronal cells that provide support and nutrition, maintain homeostasis, form myelin, and participate in signal transmission in the nervous system. In the human brain, glia are estimated to outnumber neurons by about 10 to 1 (SFN 2000). The axon of a neuron (nerve cell) is a long, slender projection that conducts electrical impulses away from the neuron's cell body, or soma. The axons of neurons may or may not be coated with myelin. Myelin is a phospholipid layer that is an outgrowth of glial cells. Myelin-coated axons appear white, and thus these regions of the CNS are called "white matter," while "gray matter" is composed of unmyelinated neurons. Cerebral and spinal white matter do not contain dendrites, which can only be found in gray matter. Dendrites are branched projections of a neuron that act to conduct the electrical stimulation received from other neural cells to the cell body. Gray matter contains dendrites, along with neural cell bodies and shorter axons. Generally, white matter can be understood as the parts of the brain and spinal cord responsible for information transmission (axons); whereas, gray matter is mainly responsible for information processing (neuron bodies). In the human spinal cord, the axons coated with myelin are on the surface and the axon-dendrite networks are on the inside, while in the brain this is reversed (Chamberlin and Narins 2005). In the developing fetus, the CNS originates from the neural plate, a specialized region of the ectoderm and the most external of the three embryonic layers. During embryonic development, the neural plate folds and forms the neural tube. The internal cavity of the neural tube will give rise to the ventricular system. The regions of the neural tube will differentiate progressively into transversal systems. First, the whole neural tube will differentiate into its two major subdivisions: Spinal cord (caudal) and brain (rostral/cephalic). Consecutively, the brain will differentiate into brainstem and prosencephalon. Later, the brainstem will subdivide into rhombencephalon and mesencephalon, and the prosencephalon into diencephalon and telencephalon. The rhombencephalon gives rise to the pons, the cerebellum and the medulla oblongata; its cavity becomes the fourth ventricle. The mesencephalon gives rise to the tectum, pretectum, cerebral peduncle and its cavity develops into the mesencephalic duct or cerebral aqueduct. The diencephalon gives rise to the subthalamus, hypothalamus, thalamus, and epithalamus, and its cavity becomes the third ventricle. 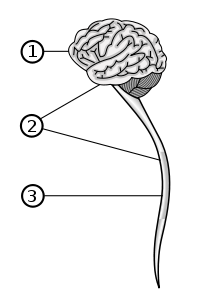 Finally, the telencephalon gives rise to the striatum (caudate nucleus and putamen), the hippocampus and the neocortex, and its cavity becomes the lateral (first and second) ventricles. The basic pattern of the CNS is highly conserved throughout the different species of vertebrates and during evolution. The major trend that can be observed is towards a progressive telencephalization: While in the reptilian brain that region is only an appendix to the large olfactory bulb, it represent most of the volume of the mammalian CNS. In the human brain, the telencephalon covers most of the diencephalon and the mesencephalon. Indeed, the allometric study of brain size among different species shows a striking continuity from rats to whales, and allows scientists to complete the knowledge about the evolution of the CNS obtained through cranial endocasts. Since the strong theoretical influence of cybernetics in the fifties, the CNS has been described as a system devoted to information processing, where an appropriate motor output is computed as a response to a sensory input. Yet, many threads of research suggest that motor activity exists well before the maturation of the sensory systems and then, that the senses only influence behavior without dictating it. This has brought about the conception of the CNS as an autonomous system. Infections of the meninges, the membranes of connective tissue that protect and nourish the neural tissue, are called meningitis, and can be bacterial, viral, and protozoan (Chamberlin and Narins 2005). Also life-threatening are bacterial infections of the cerebrospinal fluid (Chamberlin and Narins 2005). Other diseases impacting the central nervous system are rabies, polio, and sub-actue scierosing pan-encephalitis, and the brain is also susceptible to disease, such as toxoplasmosis or even brain damage from physical injury (Chamberlin and Narins 2005). Society for Neuroscience (SFN). 2000. Astrocytes. Brain Briefings. December 2000. Retrieved May 12, 2007. Latest Research on the Brain and Central Nervous System From ScienceDaily. History of "Central nervous system"
This page was last modified on 24 January 2017, at 16:58.